Those who find cruising across the water a touch too leisurely should try the wild adrenaline rush of powerboating for size. Open the throttle and feel the ferocious roar of the supercharged engine as the boat tears across the water surface leaving its passengers spray lashed, wind beaten and euphoric. Powerboating is an activity in a motorised boat that has a high power to weight ratio and a hull designed for planing, thereby allowing high speeds and improved handling. Whereas motorboating is for more leisurely pursuits on the water with family and friends, recreational powerboating attracts those with a lust for speed and competitive racing. 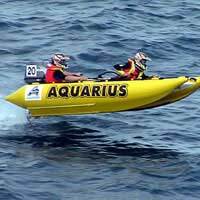 Powerboats can include rigid inflatable boats (RIBs) or sports boats like the Honda F4 Powerboat or the light and massively overpowered Zap Cat. They are usually powered by an outboard engine and rarely have accommodation on board. Powerboating is often associated with watersports such as water-skiing, wakeboarding and powerboat racing but they are also used for short coastal or inland trips and for fishing and diving. The term powerboat is also sometimes used to refer to the more luxurious and larger motor yachts. The RIB is so named because of its rigid hull and upper inflated buoyancy chambers. They are often used as rescue boats and designed so that if one of the buoyancy chambers is punctured there is always sufficient reserve. It is recommended that anyone who decides to buy a sportsboat should tackle one of the Royal Yachting Association’s (RYA) powerboat courses before setting out, particularly if going out to sea. Many activity centres offer group taster courses for those who want to find out whether the world of powerboating is for them before committing to a full-time course. These taster days usually cost from £50 to £80 and give the student a first-hand experience behind the wheel of a powerboat along with instruction on control, basic principles and safety. Level 1, 2, intermediate and advanced RYA courses are available for those who fall for powerboating’s heady charms. These cover such basics as boat handling, theory and navigation and seamanship and range in price from £100 to £200. Most of those who take up powerboating as a hobby, as opposed to a means of transport, have a thirst for speed and so when having mastered the basics usually end up entering the realm of powerboat racing. Powerboat racing is one of the most exciting watersporting activities and comes in various shapes and sizes depending on whether boaters want to race on inland lakes, rivers or out on the open sea – jetsport, circuit and offshore racing. Beginners to the sport are advised to contact their local powerboat racing club and enquire as to how to join the next basic or club racing contest. In order to go basic or club racing you will be required to pay the club a race entry fee and to purchase an event licence. The entrance fees vary between disciplines and typically cost in the region of £50 to £75. An RYA event licence purchased through the club at the race site will cost £40 for circuit and £60 for offshore events. Powerboating does not attract those seeking traditional thrills of sailing or the relaxed exploration of motor cruising; instead it suited to those who love power, speed and the freedom of an open sea.